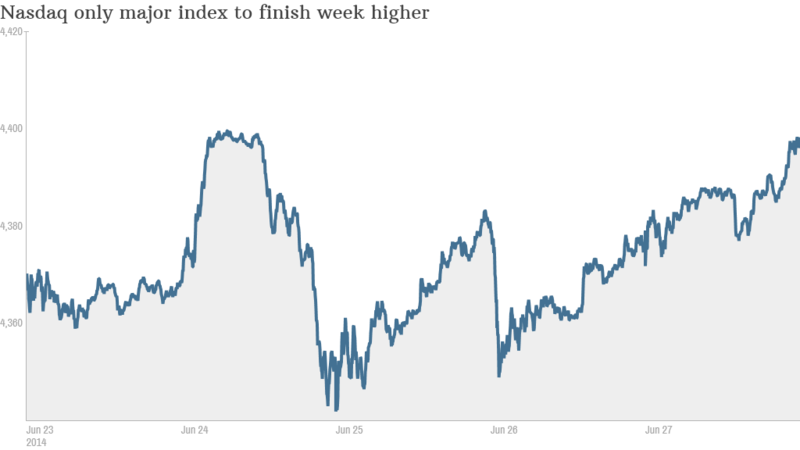 The Fourth of July is a week away, but there have been a few fireworks this Friday in the stock market. The S&P 500, Dow Jones Industrial Average and the Nasdaq all finished the day positive after a late surge, with the Nasdaq up 0.4%. The tech-heavy Nasdaq has been the star performer of the week, finishing up nearly 0.7% and at a 14-year high. The other two indexes finished the week in the red. 1. Investors ignore Michaels debut, but clamor for more GoPro: Shares in GoPro (GPRO), the sports-oriented camera maker whose shares started trading Thursday, continued to surge. The stock is up 14% Friday, a strong move after yesterday's momentous 30% spike. To put that in perspective, the stock priced at $24 and it finished the week at $36. Investors are less enthusiastic about crafts retailer Michaels (MIK). It started trading Friday morning -- eight years after private equity firms Blackstone and Bain Capital took it private -- on the Nasdaq with the symbol "MIK". The company's shares priced at $17 and moved little since trading commenced. The company raised $472 million in the IPO. Perhaps the biggest news in the IPO world this week is that Chinese e-commerce giant Alibaba chose to take what could be America's largest-ever IPO to the New York Stock Exchange. Yahoo (YHOO), which owns a stake in Alibaba, has enjoyed a nice bounce the past two days. It ended the day up 1.8%. 2. 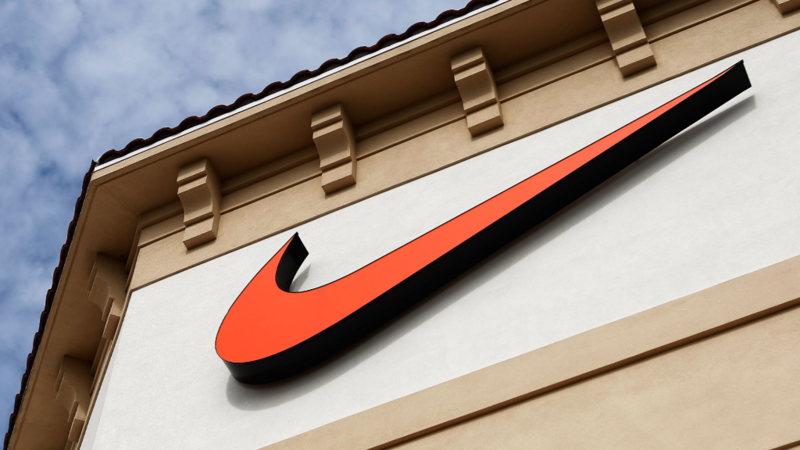 It's the shoes: Nike (NKE) and sneaker store chain Finish Line (FINL) both gained after the companies reported earnings and sales that surpassed Wall Street expectations. Nike finished up 1%. Nike said in its earnings report that the best news is coming out of Europe, with 18% sales growth. And with all the focus on the World Cup in Brazil, it should come as no surprise that sales from the company's soccer segment were also up sharply. Shares of Nike rival Adidas (ADDDF) closed slightly higher in Germany, and Finish Line competitor Foot Locker (FOOT) closed 2.6% higher. 3. Dollar store drama and coffee surge: Shares in Dollar General (DG) ended the day more than 7% lower after CEO Rick Dreiling announced that he was retiring in 2015. Activist investor Carl Icahn has a 9.4% stake in Family Dollar (FDO), which many suspect he wants to merge with Dollar General. Family Dollar stock dipped 2%. Related company Dollar Tree (DLTR) was slightly negative as well. Keurig Green Mountain (GMCR) shares had a perky day, up over 4% to lead the S&P 500. Research firm Argus upgraded the stock to "buy" on estimates that sales and profits will improve. 4. BNP pares dividend: The Wall Street Journal is reporting that BNP Paribas (BNPQF), the French banking giant that's nearing a $9 billion settlement with the Justice Department, will be cutting its dividend by an unspecified amount because the payment will hurt its balance sheet. The Paris-listed shares of the bank closed flat. London-listed Barclays (BCS), another big European bank in the spotlight because of a dark pool-related lawsuit from the New York Attorney General, also closed flat after yesterday's 6.5% drop. 5. International markets: Asian stocks finished the day mixed, with Chinese and Indian stocks closing slightly higher. European markets closed mixed today, but all ende.